Pumpkin Truffles. Are you sick of pumpkin yet? I am so obsessed with pumpkin recipes these days. These pumpkin chocolate truffles are delicious and they would be perfect for a Thanksgiving dessert. I had to stop myself from eating more than one. These pumpkin chocolate truffles may be my most favorite pumpkin dessert recipe yet! You can’t really go wrong with pumpkin and chocolate! These pumpkin truffles are a little bite of heaven. You only need 7 ingredients to make them! They are vegan, gluten free and paleo. Imagine a pumpkin cream covered in chocolate. Perfection! I used chocolate chips in my recipe, but this would also work with my 3 ingredient chocolate recipe. If you choose to use that, don’t add the milk. Just make the chocolate sauce as is. I hope you enjoy this as much as I did! 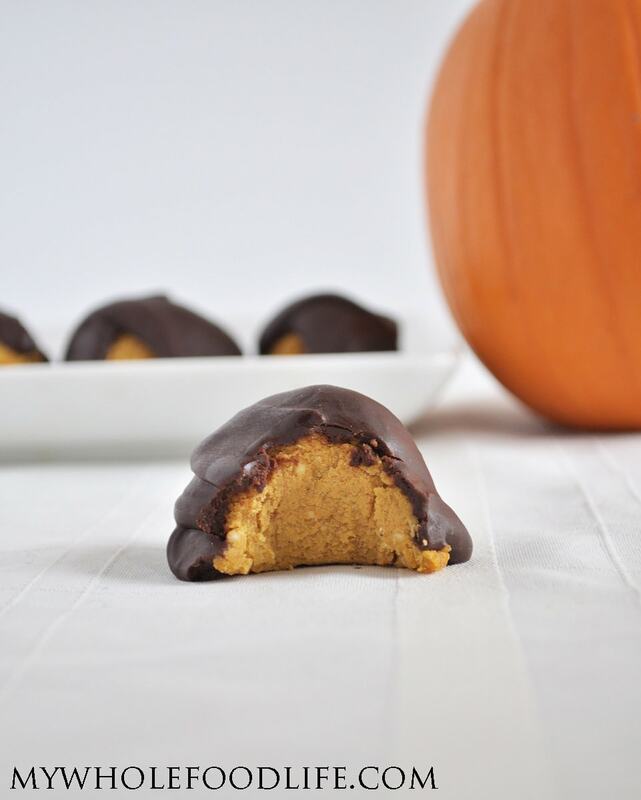 Pumpkin and chocolate go so well in this easy truffle recipe! In the food processor , combine all the ingredients for the pumpkin cream. Blend until smooth. Using a cookie scoop , drop mixture onto a lined baking sheet . Place the baking sheet in the freezer to firm while you make the chocolate mixture. Place a glass bowl on top of the pot with the water. Add the chocolate chips and almond milk to the glass bowl and gently melt the chocolate. Once all the chocolate is melted, use a spoon to drizzle the chocolate over each truffle. Please keep these truffles in the fridge. They should last a couple weeks. You can freeze them for longer storage. Enjoy! Like that these treats also happen to be gluten free and egg free. If you happened to find the right chocolate chips, they could also be dairy free. Plus they sound delicious. Pinned. HI. I want to make these! But I am not vegan, paleo, or gluten-free. Is there something I can use instead of cocoa butter? I don't have any. Any other alternate ingredients? I like to have options so that I do not have to run to the store! Thank you so much. Normally for most recipes, there is usually a sub, but I am not 100% sure what to replace it with in these. You can try using cream cheese? If so, you will need to keep them in the freezer. I am still not 100% sure it will work though.